(Ojai, CA, April 4, 2017)—Santa Barbara certified appraiser Dr. Elizabeth Stewart has been recognized as a finalist in the 19th annual Foreword INDIES Book of the Year Awards. Her book is one of 10 finalists in the Reference category. The awards will be announced and presented in June at the American Library Association annual meeting in Chicago. 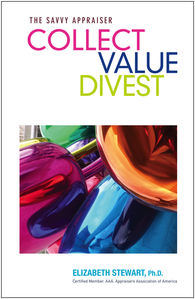 In noting the qualities for selection, the INDIES Panel noted: "Collect Value Divest: The Savvy Appraiser delivers short, concise chapters so that any collector can easily learn how to value their paintings, books, artifacts, and treasured possessions. Dr. Elizabeth Stewart condenses her thirty years as a certified appraiser into easy-to-read anecdotes that cover commonly asked questions about value. She provides tips on how to buy, sell, insure, and auction, and explains how to bequeath pieces." As part of Foreword Review’s mission to discover, review, and share the best books from small, university, and indie publishers (and authors), independent media company Foreword Reviews hosts its annual awards program each year. Finalists represent the best books published in 2016 that were submitted to Foreword Reviews for award consideration, and were narrowed down by Foreword’s editors from over 2,200 individual titles spread across 65 categories. INDIES finalists are moved on to final judging by an expert panel of librarians and booksellers curated specifically for each genre, who will determine the books that will be named Foreword INDIES Book of the Year Award winners. Winners in each genre—along with Editor’s Choice winners and Foreword’s INDIE Publisher of the Year—will be announced during the 2017 American Library Association Annual Conference in Chicago on June 24, 2017. To learn more about Elizabeth Stewart and her book or popular blog, visit: www.ElizabethAppraisals.com.